This Avocado Chicken Salad recipe is a keeper! 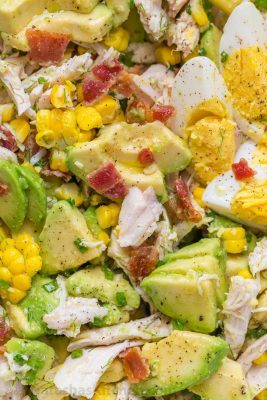 Easy, excellent chicken salad recipe with lemon dressing, plenty of avocado, irresistible bites of bacon and corn. Optional: For even more protein, we add 2 hard boiled eggs, halved or quartered. Dice or shred the 2 large cooked chicken breasts and place into a large mixing bowl. Peel and pit 2 large avocados, slice into bite-sized pieces and add to the mixing bowl. Add 1 cup of cooked corn (freshly cooked corn is best), toss in 1/4 cup chopped green onion, chopped bacon, and 2 Tbsp fresh Dill. Add dressing ingredients to a small bowl and stir to combine. Drizzle over your salad and toss to combine. Serve with slices of hard boiled egg if desired. *Use rotisserie chicken, cook your own chicken breast seasoned with salt and pepper or use well-drained canned chicken. **For a healthier salad, you can use uncured turkey bacon which tastes amazing, but has less fat.